healthytrading: Weekend Alert - Dow Breakout! Weekend Alert - Dow Breakout! Alright, it was coming - a rally that would be based on the ECB's decision. Luckily for the market, it was good news on Thursday when ECB announced an unlimited bond buying programme that will supply liquidity to cash-strapped banks and to restart economic growth in the region. Whether this plan clearly works in the long run or not, or whether structural problems still inherent in the system needs to be weeded quickly, the market has responded quite favourably to this piece of news. 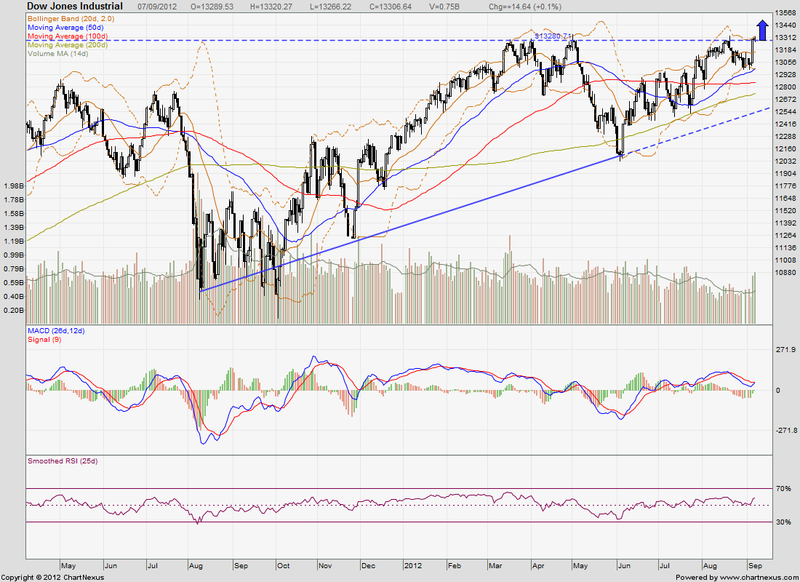 By Friday 7 Sept, Dow Jones index managed to mildly break the psychological 13280 level to close at 13320. Quite impressive given the short span from Thursday's ECB announcements. Market volumes have also returned in anticipation of more uptrend.